The Palio of Siena takes place in the city of Siena, Tuscany by a long long time ago, its origins dated back to 1260, the date of the Battle of Montaperti, when the final tournament for the Independence Assumption ceremonies became a symbol of Siena under the protection the Virgin. 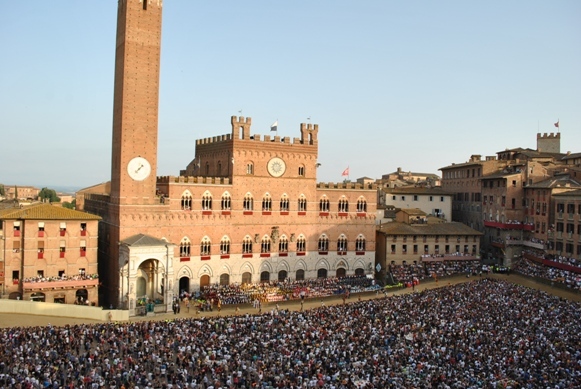 Each year, the Palio is held on 2nd July (Palio of the "Madonna di Provenzano") and August 16th (Palio of "Our Lady of the Assumption") and the Palio still refers to Regulation of 1656, which marks the official birth of the Palio of and Piazza del Campo is the place where the event is run. -the easiest is to take position in the centre of the piazza (no tickets required) but please consider that you have to stand many hours and there is no toilet facilities in this section. - the 3rd is to book a window, or better still a balcony, of the houses and palazzos overlooking the square. Whatever your vantage point, make sure you choose a contrada to root for – it makes the whole experience so much more fun.